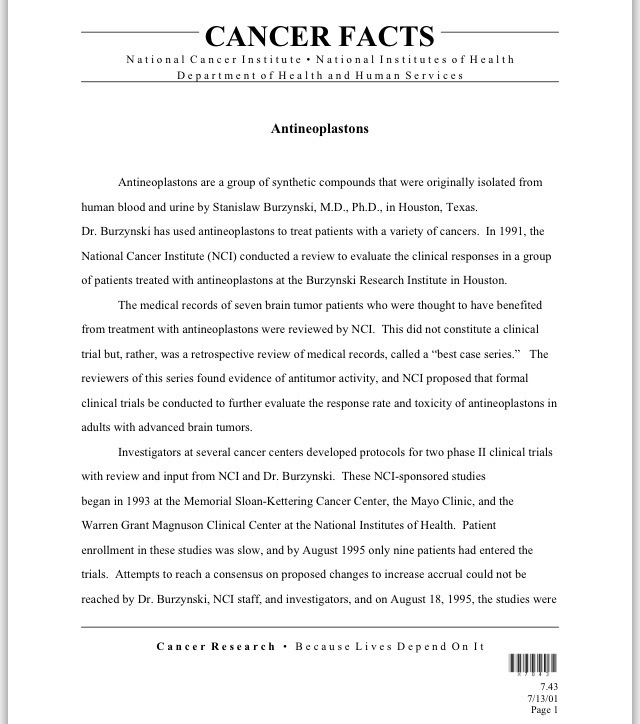 This entry was posted in American Cancer Society, critique, critiques, critiqued, critiquing, research and tagged "After the reviewers found some evidence of antitumor activity ... ", "American Cancer Society Antineoplaston Therapy Overview", "American Cancer Society", "ANP's", "ANTINEOPLASTON THERAPY HS-183 pg. 2", "BlueCross BlueShield of Alabama Antineoplaston Cancer Therapy Policy #: 280 Category: Medicine", "Bruce A. Chabner M.D. Director Division of Cancer Treatment", "CANCER FACTS National Cancer Institute • National Institutes of Health Department of Health and Human Services Antineoplastons pg. 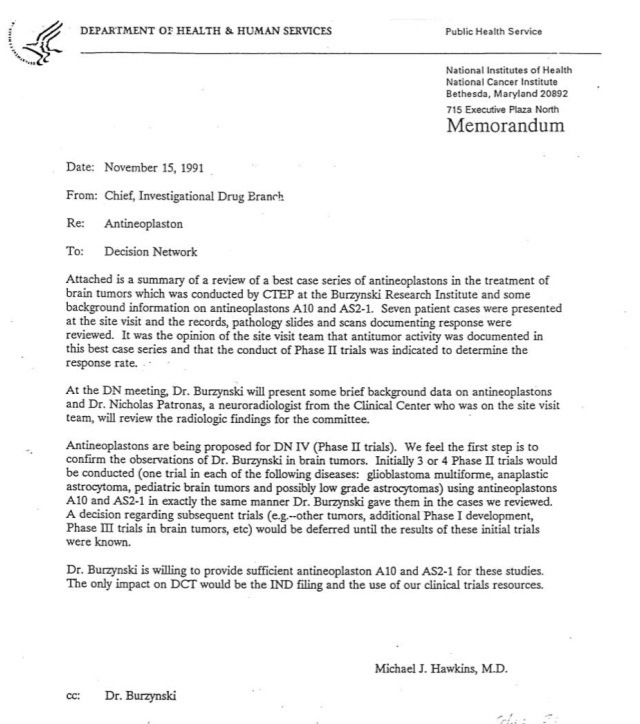 1", "Critiquing: American Cancer Society - Antineoplaston Therapy", "Decision Network Report", "Department of Health &Human Services Public Health Service", "Freedom of Information Act", "Head Quality Assurance and Compliance Section Regulatory Affairs Branch", "In other words there is no convincing evidence showing that antineoplastons actually work", "invited consultants", "Michael A. Friedman M.D. 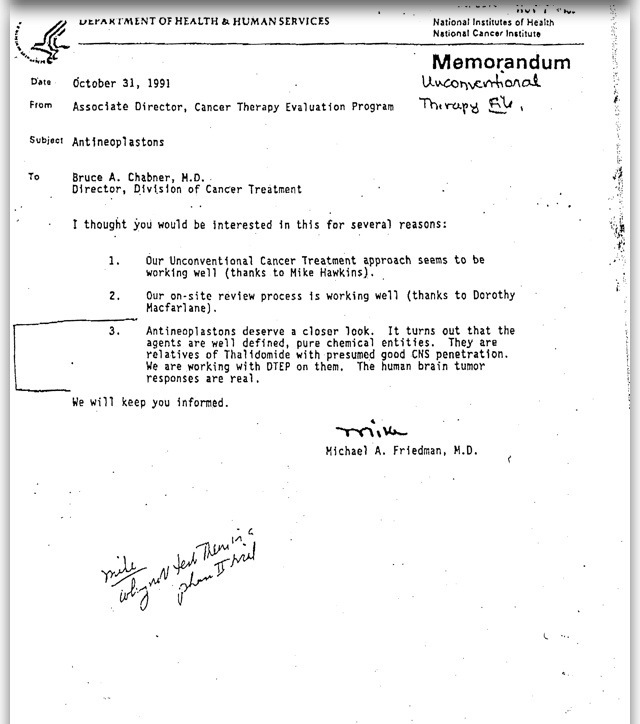 Associate Director Cancer Therapy Evaluation Program (CTEP)", "Michael J. Hawkins M.D. Chief Investigational Drug Branch", "National Institutes of Health (NIH) Clinical Center", #ACS, A10, ANP, antineoplaston, antineoplastons, AS2-1, “3. 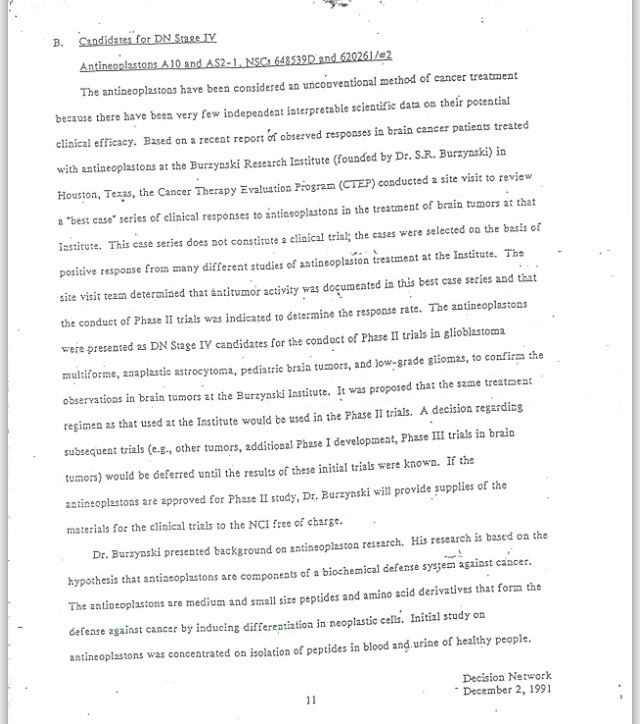 Antineoplastons deserve a closer look”, “It turns out that the agents are well defined, “It was the opinion of the site visit team that antitumor activity was documented in this best case series … “, “The human brain tumor responses are real”, “The reviewers of this series found evidence of antitumor activity … “, “The site visit team determined that antitumor activity was documented in this best case series … “, Dr. Stanislaw R. Burzynski, FOIA, http://m.cancer.org/treatment/treatmentsandsideeffects/complementaryandalternativemedicine/pharmacologicalandbiologicaltreatment/antineoplaston-therapy, http://www.emory.edu/KomenEd/PDF/Treatment/Antineoplastons.pdf, https://www.bcbsal.org/providers/policies/final/280.pdf, https://www.wellcare.com/WCAssets/corporate/assets/HS183_Antineoplaston_Therapy.pdf, National Cancer Institute, National Institutes of Health, NCI, pure chemical entities“ by didymusjudasthomas. Bookmark the permalink.